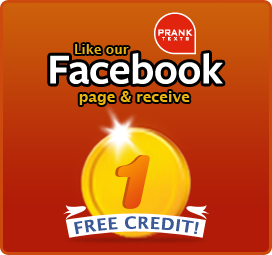 like our Facebook page and receive 1 FREE credit! Sending joke text messages has become increasingly popular, and for a good reason, because we like to make our friends laugh. There are many ways you can send and receive Funny Joke text messages and pranktext.com has made it easy and cheap. As the demand is increasing, many companies have come up with pricing that they say is cheap and beneficial for you. But the truth is that you probably won’t be getting the ‘so called’ funny SMS packages that you have paid for. Prank Text has created bundles that have been tailored for every user, from the occasional prankster to the class clown. With us funny joke text sms are more fun because we offer the best service at the lowest rates with the assurance of high quality global network coverage. This allows the instant delivery of messages and keeps you from waiting and getting annoyed. Try us for free and enjoy Funny Joke SMS like never before! Creating account with us is easy. What you are waiting for? Register and try it - it's completely free. Get your friends before they get you. Prank Texts is a prank texting service that enables you to send fake prank SMS jokes and spoof text messages to your friends worldwide. Please do not use this service for malicious, libellous or illegal messages, or any other purposes likely to cause harm or distress to the receiver or related parties. Please login to your account before you purchase bundle.